Snapchat recently rolled out a new Travel Mode that aims to help you reduce unnecessary data use. Here's how it works. On the Manage page, turn on Travel Mode to stop content from auto-loading when you're connected to the mobile networks, as opposed to your home Wi-Fi, for example. One of the benefits of using Snapchat, the "disappearing" social photo and video app, to share media is that it doesn't fill up your photo library with stupid selfies or the pointless photos of that lunch you just had to share with friends. However, the app does tend to use up a lot of wireless data and battery life, which is unfortunate for those of us with limited data plans and older smartphones. Thankfully, the company rolled out a new Travel Mode feature this week that mitigates these issues. Snapchat Travel Mode aims to reduce the amount of data the app uses. To enable the new setting, first make sure you have the latest Snapchat update from your app store (v9.14.1.0). 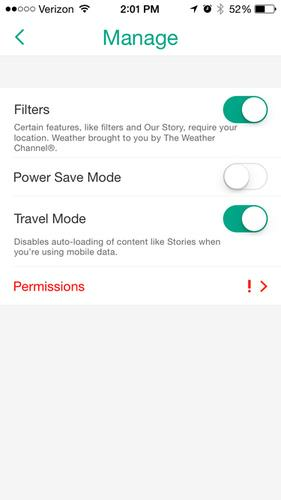 Next, go into the Snapchat app and click the Settings button on the home screen, scroll down the menu to Additional Services, and click Manage. On the Manage page, turn on Travel Mode to stop content from auto-loading when you're connected to the mobile networks, as opposed to your home Wi-Fi, for example. This feature is especially handy if you use Snapchat Stories, or Snapchat's live feeds that normally auto-load, regardless of whether you are on Wi-Fi or a cellular network. Auto-loading is a good thing, because it doesn't make you tap on a Story and then wait for it to download. On the other hand, it can be bad because it uses a lot of data. If you monitor data use so you don't max out each month, the feature should be more than welcome. If you have unlimited data, or just don't care, you can leave the settings as is. It may be difficult to tell how effective Travel Mode is at reducing data drain, but it's a step in the right direction. Snapchat also recently made a few other subtle changes. Specifically, the company eliminated the need to hold your finger on "snaps" to watch them, which was an inconvenience. It also this week added a new emoji button called Sticker Picker, which lets you place emojis anywhere on photos or video -- not just alongside text.